I hated wearing glasses so in my 20's, I began to wear contact lenses and did so successfully up until about 5 years ago when genetic eye-dryness made lens wearing too uncomfortable for anything more than a day or two a week. So it was back to the glasses again and in recent years, I made more of an effort to buy funky, interesting frames so that the glasses were making a statement. But I was never happy with them and always took them off for photos or nights out etc. As far as I knew, the only long term solution was laser surgery. The idea of laser scares the life out of me and it's expensive but I was seriously considering it until I was told that my results would be short lived (perhaps 5-7 years) and in that time, I'd have to wear reading glasses as my short sightedness would be corrected to such a degree that my long-sightedness would be compromised. So with that news, I put aside all thoughts of ever ditching the specs. That was until Gillian Gervais (a reader of this blog) sent me a message back in September inviting me to the opening night at the new location of her optician practice in Carryduff. I wasn't able to make it but it started a thread of messages about my sight which led to Gillian telling me about Ortho-K Nocturnal™ lenses. 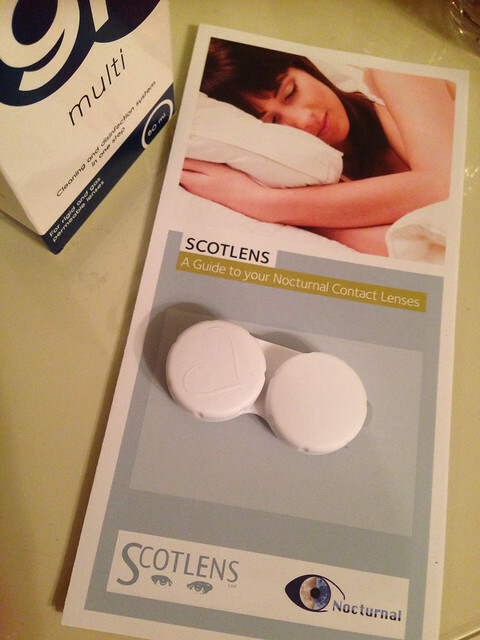 Gillian's own website and the Scotlens website can tell you all the science but essentially Nocturnal™ Orthokeratology (Ortho-k) is the process of wearing a contact lens only when sleeping in order to correct short-sight. Stable corrected vision is provided all day without the use of contact lenses or spectacles. The process is reversible and in 2010 established by the FDA as having the same safety as soft contact lenses. I'll repeat the important bit - corrected vision provided all day without the use of lenses or glasses. To be honest, I was sceptical - it just sounded too good to be true but I agreed to come in to talk to Gillian and find out more. 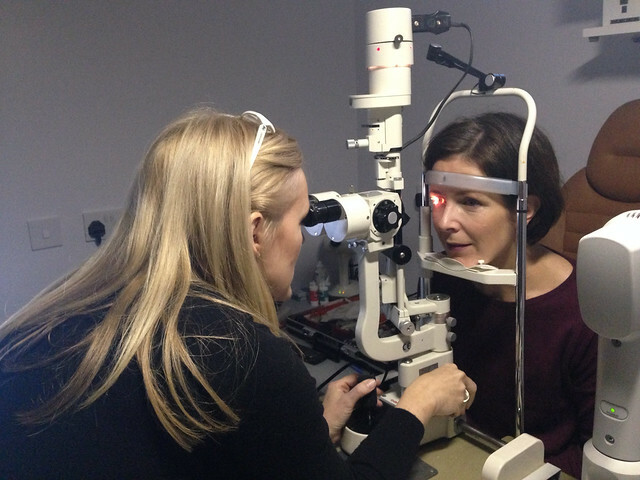 At this initial appointment, Gillian assessed my eyes to make sure they were suitable for the lenses. She also took topographical images of the eye that show the level of short-sightedness so that progress when wearing the lenses could be measured. A week later, my lenses arrived and I had a second appointment with Gillian to be shown how to put them in and take them out. They're hard lenses - so if, like me, you're a soft lens wearer, putting them in isn't greatly different but taking them out does take a bit of getting used to. After a few attempts & trying a couple of different techniques, I mastered it and was cleared to bring my lenses home with an appointment booked for the next morning so Gillian could assess how the first night went. You put these lenses in literally as you're about to turn out the lights for the night - you shouldn't read or watch TV while wearing them. Equally, in the morning, taking them out is the first thing you do. Incidentally, you can see perfectly with the lenses in so there are no issues if you wake in the night and need to tend to a crying child. Friends have asked if they're comfortable to sleep in. I think they're like mouth braces or rollers in your hair - you're aware of them initially so my first night's sleep wasn't the soundest I've ever had but a day or two on, I was sleeping through with no issues at all. When I'm awake, I am aware of them in the eyes but once my eyes are closed, I can't feel them at all. But now for the best bit - the results! That first morning, I took out the lenses and it was like a miracle had happened overnight. For your first few days, the sight does diminish slightly as the day goes on so Gillian saw me early that first morning for an assessment. Normally, you correct to about half your prescription on the first day so I was a little lower than that - attributable most likely to a poor night's sleep. But even after just one night's wear, I managed without my glasses until about 3pm that day. On Day 2, the results lasted a couple of hours longer so that by day 5, I was getting a full day of perfect vision. In fact, at my most recent check up, I was measuring with 20/20 vision. I've been wearing them now for just over a month and have not worn glasses since that first day. The lenses are so effective that they actually over-correct my vision slightly if I wear them every night, meaning I can now miss a couple of nights through the week without losing 20/20 sight. Putting them in and taking them out takes seconds now and the few minutes spent cleaning/disinfecting for the next night is just part of my morning routine. The little things that non glasses/lens wears take for granted like putting on make-up, swimming, having a shower - what a novelty to actually be able to see what you're doing! Also, and this is a small one but means a lot to this sunglass lover - I can wear whatever sunglasses I fancy now - no need for dodgy prescription ones. In terms of cost, there's an up-front payment of £150 which covers the initial consultation and assessment & the lenses themselves. If all is going well after a few weeks, there's a balance of £200 payable. Thereafter, you pay £25 a month, which covers the cost of your next pair (lenses are replaced annually) and all the ongoing support. And in case I've not already convinced you about how sold I am on these lenses, I've signed up to my standing order already. It's not much more than I was paying already per month for daily lenses (that I couldn't even wear all day) so it's a bit of a no-brainer. The lenses are ideal for children too so I'm going to get my son assessed for them once he starts at big school. The benefits are obvious from a sporting perspective but in fact, the way the lenses correct the vision means they can in some cases actually stop short sightedness worsening - amazing for younger glasses wearers. Gillian has fitted boys and girls from about age 10 for the lenses and the reports back are fantastic from a confidence/self-esteem point of view AND in terms of how they've helped children involved in contact sports and/or water sports. In terms of suitability, if you can see close up better than far away and your prescription is up to -5, you can explore Ortho-K lenses and if you're local, Gillian Gervais is the woman to contact. Contact details and more information on the lenses can be found on her website on this link. If you're further afield, you can find a list of practitioners on this link and it's possible to search for the closest one to you by post code. Please just ask if you've any questions about the lenses, either in the comments section below, on social media or via email at schoolgatestyle@yahoo.co.uk. 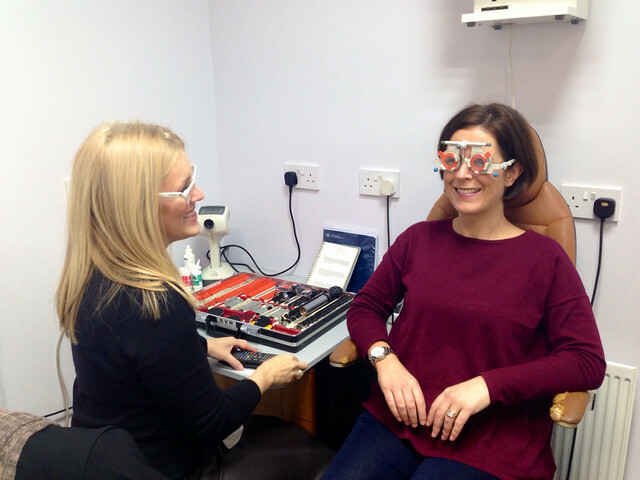 Thank you to Gillian Gervais Opticians and Scotlens for enabling this post. No payment was made to me for writing it but I was gifted this initial set of lenses. Oh my goodness! I've never heard of this, and its kinda rocked my world, what an amazing idea, and invention! that's amazing!! i'm going to forward this post to my sister, as i think she'd be really interested in ths. can only imagine how life changing they must be! Actually, i dont mind wearing glasses, i just hate being short sighted!! oH MY WORD!! i'VE NEVER HEARD OF THESE EITHER BUT THIS IS INCREDIBLE. i'VE BEEN WEARING GLASSES SINCE MY EARLY TWENTIES, AND CAN'T GET ON WITH CONTACT LENSES - i WEAR THEM NOW AND AGAIN IF i NEED TOO. mY ELDEST DAUGHTER HAS WORN GLASSES SINCE THE AGE OF 18 MONTHS THOUGH, AND ONE EYE ISN'T VERY GOOD, WHILST THE OTHER IS PRETTY NORMAL NOW. tHESE COULD BE AMAZING FOR HER. oNE QUESTION - i WEAR VARIFOCAL GLASSES NOW SO WOULD THEY WORK WITH MY VISION? Hi. How many hours minimum would you need to be asleep for the lenses to work effectively? I usually only manage around 6hours! I remember Philip Schofield trying these on This Morning a few years ago, he said they were amazing & I think he still uses them. My daughter has been wearing these for five years now! She was 11 years old when she started. It means amongst other things she can do sport at school with no glasses. They are amazing. We see an incredible optician in Sevenoaks. My son also wears them and has done for 3 years since he was 11. And the monthly cost is only slightly more than the cost of daily disposable lenses.